This summer was a busy but fulfilling adventure. In July, Youth Unlimited teamed up with Walnut Grove Secondary to run a summer school program called Gator Shades. The goal of this program is to help youth transition from elementary school to high school. We were able to spend three weeks with a group of 25 kids, helping them become familiar with the high school and accompanying them on educational field trips. 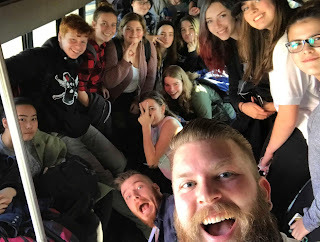 This was a great start to the summer as it gave us the chance to connect with grade eights. Since they are already familiar with us it will be easier to connect with them once school begins. This program can be exhausting, but it will be worth it when I walk through the hallway this September and see their faces light up because someone recognizes them in the crowd. This September is the first time in five years that I am not going back to school which means I can now fully devote all my time to Youth Unlimited and take on more hours. Although I am not going back to school myself, I still get to walk through the hallways of Walnut Grove Secondary School and it feels great to be connected with students and teachers already. It has been a year of growth and learning and I am excited that I am becoming more known within the high school. It is programs like Gator Shades that make me grateful for the work I get to do. Another exciting event that has been taking my time throughout the summer is preparing for a new project called Student life. We are collaborating with a program called Ambassadors of Compassion which is a leadership program for high school students who want opportunities to lead, inspire, motivate and equip themselves for a healthy hope-filled future. I am looking forward to leading the project, developing deeper relationships with the youth and watching them grow. I would ask for continued prayer as I begin the new school year. May I be filled with energy and excitement, may the Student Life program be a benefit to our students and may they will see growth within themselves. I also ask that you pray for continued support through prayer as well as finances to appear so that I may continue working four days a week.